We all love hand-making for the holidays, and each Friday from now through the end of the year we are sharing some of our favorite seasonal sewing projects – from decorations to brighten your home to projects that make great gifts. This week we’re sharing some of our favorite quick-and-easy projects for winter warmth, from mittens to quilts, that make wonderful gifts for those in need this season. Don’t have a clue where to donate handmade items to help people stay warm in your community? That’s okay, we’ve got some suggestions to help, just scroll to the bottom of the post! 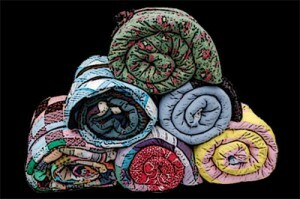 Quilts made with big pieces of fabric stitch together in a jiffy and make a wonderfully warm way to sew to serve others! Use MaryQuilts.com’s Quick Strippie pattern for a fun quick quilt, or give Mary Pepper’s free Big Block Style quilt from AllPeopleQuilt.com a try. You’ll never guess how easy it is to put together a quick blanket to help someone stay warm this winter season. Learn all about The Sleeping Bag Project at the official website, and find the Ugly Quilt Pattern here. 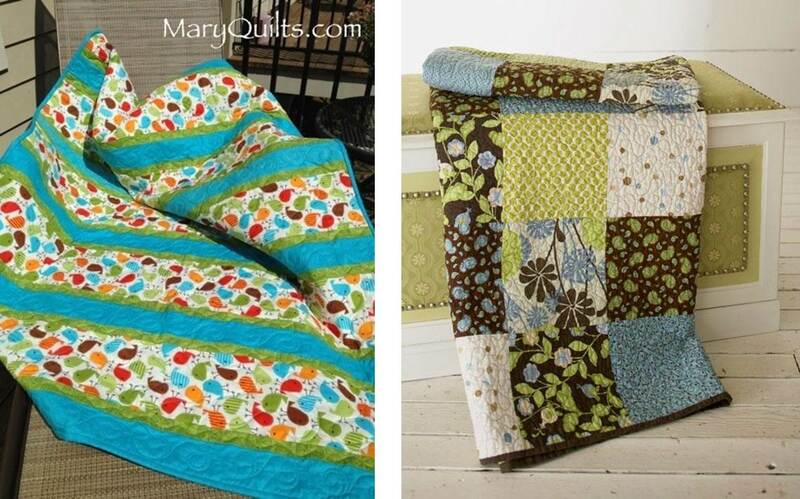 Maybe you’d like to use up some of those scraps to make a quick quilt? Why not pair your scraps with a solid just like Red Pepper Quilts? Learn how with the Pieced Scrap Border Quilt Block Tutorial. Or, learn how to make scrappy String Quilt Blocks from The Little Red Hen. Make a simple scarf in one of 5 styles from Fleece Fun’s list of Top 5 DIY Scarves. 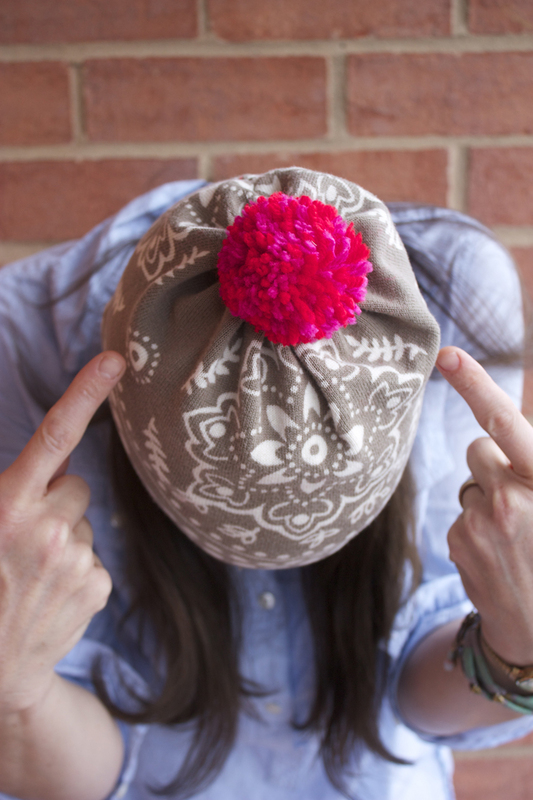 Sarah Hearts shows you how to take an old, really warm sweater and recycle it into a super warm hat topped off with a colorful pom-pom! Find a size that works well for most adult heads (use a friend or family member as a test), and make some hats to give as donations. 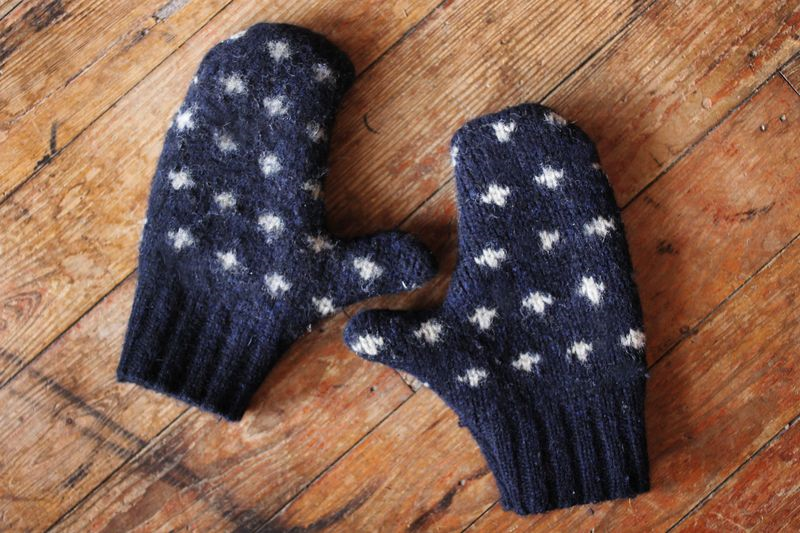 Learn how to Sew Your Own Mittens from A Beautiful Mess. Use recycled winter sweaters or make new from fleece! Krista from Lazy Saturdays shows you how to take one sweater and turn it into three awesome accessories! 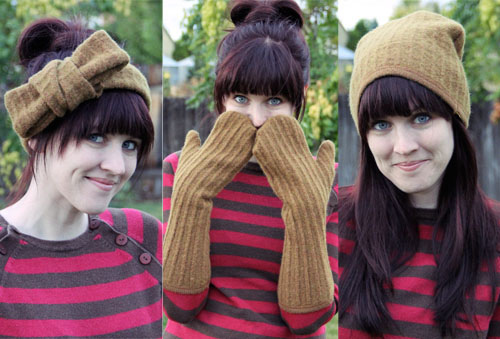 Get the Three Accessories from One Sweater tutorial right here. Almost all communities here in the United States host local charities dedicated to serving those in need. Some of those charity organizations need hats, scarves and mittens, and even quilts and blankets to help people stay warm this winter. Find these organizations by searching your local yellow pages, or by searching the Internet. Search for homeless shelters, shelters specifically for men, women or children, nursing homes, veteran’s hospitals and homes, foster care organizations, food pantries or free meals, and long-term care facilities. Next Next post: WeAllSew Celebrates Our Loyal Fans: 65,000 Likes!